The fibrous microstructure of human soft tissues is responsible for a complex mechanical behavior at the macroscopic scale, highly non-linear, anisotropic and visco-hyperelastic. Since the 1960s and the boom of “bionics”, a large field of research has been developed to mimic the materials and structures of evolving systems. Nowadays, the biomimetic approach is very promising for the treatment of soft-tissue pathologies, though it still needs important progress from fundamental research, in particular when it comes to biological oscillators such as vocal folds. 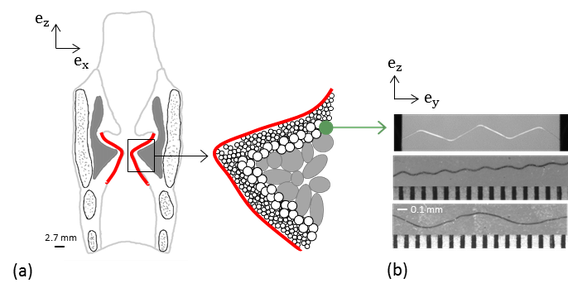 The global objective of this project is to design new fibrous synthetic composites mimicking the vocal-fold histological specificities, and to study their multi-scale mechanical and vibratory properties. (a) Scheme of a coronal view of the human larynx and zoom on the vocal-fold fibrous architecture. (b) Photographs of wavy polyamid monofilaments (diameter 50 µm) processed to mimic collagen fibres’ tortuosity at rest (from Argoud, 2015). (Above) Illustration of a uniaxial tensile test performed on a synthetic fibre-reinforced elastomeric membrane, typically processed for biomimetic design of human soft tissue (from Bailly et al., 2015). In the first step, materials mimicking the fibrous microstructure and the non-linear anisotropic mechanical properties of the vocal folds under quasi-static loadings are designed and processed. This step which relies on multi-scale modelling techniques and optimisation procedures of fibrous microstructures, is then validated thanks to mechanical tests performed on the new composites combined with kinematic field measurements. In the second step, the viscoelastic and vibratory properties of the fibrous materials obtained at step 1 are characterised under dynamic loadings. Two complementary experimental techniques are used to study the dependence of the composites’ behaviour to the loading rates, and their resonant vibration properties. In the final step, the materials are validated as new substitutes for laryngeal biomechanical oscillators, by the ex-vivo study of their mechanical properties in interaction with a humidified air-flow. Experimental tests will be carried out on an original “excised larynges” test-bench where the real human vocal folds are removed from an excised anatomical piece and replaced by the synthetic fibrous materials to be tested for sustainable self-oscillation under fluid/structure interaction. The project associates specialists in mechanics of materials (3SR Lab), experts in voice physiology (GIPSA Lab), and surgeons from the University Hospital in Grenoble (LADAF Laboratory).